Shaun Marcum has been diagnosed with “Thoracic Outlet Syndrome” and will have surgery on Monday. Marcum’s issue involves a blocked artery, but he should be able to begin throwing again in two months but will not pitch again this season and very likely never again as a Met. Marcum was very ineffective in his lone season in Queens. Marcum went 1-10 with a 5.29 ERA. I really liked the Marcum signing. I felt he has the most upside of the starting pitchers in their budget. It just didn’t work out. Marcum had been very good in the past with the Brewers and Blue Jays when he was healthy. 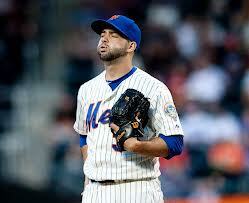 He even had postseason experience but the move just didn’t work as Marcum was the Mets worst pitcher this season. Marcum made about $4 million with the Mets this season and had some very expensive incentives he was about to earn based on innings pitched that he can no longer get. Sandy Alderson signed two players to major league contracts last winter, Brandon Lyon (who was just released) and Marcum now won’t throw another pitch for the Mets. 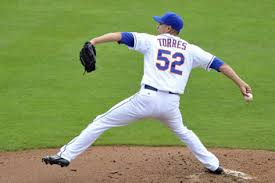 Carlos Torres who has been fantastic out of the bullpen this season will move to the starting rotation and pitch Saturday against the Pirates. The Mets plan on going with a six man rotation for the next few weeks. Matt Harvey has already publically complained about not getting the ball every 5th day and I think it would be a major mistake to get young guys like Harvey and Zack Wheeler off of their usual routine. It appeared that Dillon Gee and Jeremy Hefner were competing to keep one spot in the rotation. Both have turned their seasons around since then. Shaun Marcum hasn’t. Marcum was ineffective again giving up five runs thru 4 2/3rds in Atlanta where after Marcum’s start Wednesday night vs. the Braves he fell to 0-9 on the season with a 5.43 earned run average. Marcum’s best outing actually came out of the bullpen when he threw eight strong innings in a loss to the Marlins last weekend. He is the only pitcher who is pitching poorly right now in the Mets rotation and it doesn’t make sense to consistently use a six man rotation. Also Marcum has heavy incentives in his contract that are based on games started and innings pitched on top of the $4 million guaranteed. The Mets could save themselves some money if they move Marcum to the bullpen. I thought if the Mets were out of the race, that they could move Marcum for something decently valuable at the trade deadline. That no longer looks possible as Marcum has pitched very poorly for the most part. Marcum has been the Mets worst starter this season and if anybody should move to the bullpen it should be him. Should Dillon Gee lose his rotation spot to Zack Wheeler?? Zack Wheeler is expected to make two more starts at Triple A including vs. Salt Lake today at 3:10. The biggest question now is who will Wheeler be replacing in the rotation? Well Shaun Marcum has been much better over his last few starts including a strong seven innings with a career high 12 strikeouts vs. the Braves Sunday. Marcum is still looking for his first win as a Met however. Jeremy Hefner has been hit and miss this season but has been a little better in May. The Mets have not won a game started by Hefner this season. Dillon Gee has gotten rocked throughout this season. He has had one quality start this season and that was his first start vs. the light hitting Padres. Gee seems to pitch well for a few innings and then one big inning seems to be his downfall. Gee is 2-6 with a 6.34 earned run average. Batters are hitting 3.29 off Gee this season. He should be sent to the bullpen or to the minor leagues when Wheeler is deemed ready. Gee was solid in his first few years as a Met but he has been a disaster so far this season and as an arbitration eligible player this offseason, his time in Queens could be numbered. In three games (two starts) for the Mets this season Shaun Marcum is 0-2 with a 7.20 earned run average in 10 innings. Marcum has struggled to get through the 5th inning in both of his starts. He also had a rough bullpen appearance down in Miami in a 15 inning loss last week. The most concerning thing about Marcum is his velocity has been much worse than in previous years. Usually Marcum is in the high 80’s with excellent control. He is walking more guys than normal and when he throwing mid to low 80’s with subpar control, it’s hard to imagine him having success. I liked the Mets bringing in Marcum at the time and there is still plenty of time for him to turn it around, after all it’s been three games. Marcum is making just $4 million this season after which he will become a free agent again. The Mets don’t really have a choice anyway as they don’t really have other options for their starting rotation. I still don’t expect Zack Wheeler to be up until he will be cleared from “Super Two” status which is expected to be sometime in early to mid-June. 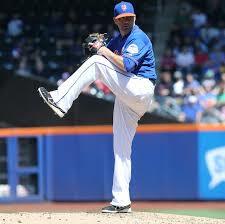 Wheeler will help but the Mets need Marcum now to stay in the race while Wheeler is in Vegas working on his control. 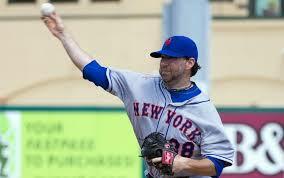 To make room for Shaun Marcum on the roster, the Mets optioned lefty reliever Josh Edgin to double AA Binghamton. Edgin, 26, has struggled badly with a 9.64 earned run average in 11 games. Interestingly though, his BAPIP (batting average on balls in play) is 4.14 compared to last year’s at .233. Edgin has been very unlucky so far this season. Practically every other time a hitter put the ball in play against he reached base. I find it interesting that Edgin is going down to double A not Triple A. To me that means that Edgin is being sent down for only a short time to figure things out. Terry Collins said Vegas wouldn’t be good for Josh where nearly every las Vegas 51 pitcher has gotten hit around. They still believe Edgin is part of the 2013 plan. Edgin is being sent down to fix his mechanics and I don’t think he’s that far off. The Mets bullpen has been awful, almost as bad as last year. 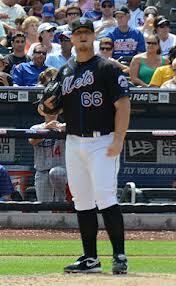 The Mets are going to need Edgin to shut down big left handed hitters as we get closer to the summer months. The Mets believe Shaun Marcum will make his Mets debut on Saturday vs. the Philadelphia Phillies. Marcum tossed 52 pitches over five scoreless innings in an extended spring training game Monday in Port St. Lucie. He later threw more pitches in a bullpen, stretching him out for a possible major league game on Saturday. After the Mets designated Aaron Laffey for assignment, it was obvious that the team thought Marcum was close. 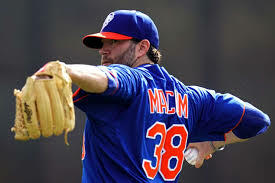 The Mets need Marcum to be effective right away as they have gotten very little out of the 3-5 spots in the starting rotation. Mets designate Aaron Laffey for assignment, what does that mean for Shaun Marcum? 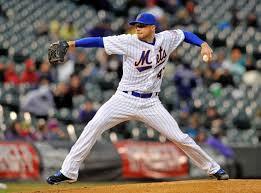 The Mets have designated LHP Aaron Laffey for assignment and called up lefty reliever Robert Carson. Laffey, 28, had a 7.20 era in 4 games (2 starts) for the Mets. He gave up a couple of hits before giving up a 3-run homer to Adam LaRoche to give the Nationals a 6-5 lead. This is good news for two reasons. For one Laffey was awful and didn’t look like he could get major league hitters out. More importantly if Laffey is being designated for assignment that means Shaun Marcum has to be getting close to making his Mets debut which is huge. Laffey was actually claimed on waivers by the Toronto Blue Jays, who seem to claim everyone these days. 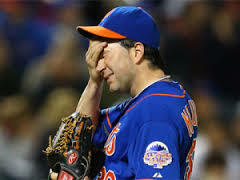 The Mets need Marcum to be that third guy in the Mets rotation. He has been that in the past when he’s been healthy. Earlier this week Marcum threw 41 pitches in 4 perfect innings during an extended spring training game. I wouldn’t bank on Marcum being healthy soon because of his injury history but by this roster move it appears as if the Mets are. Can the Mets rely on Shaun Marcum?